Note: After I posted this news, Scream Factory let me know that not all of these are being released in 2016. Some of them will be coming out in 2017. I do not know which ones are for this year and which are for 2017, but I will let everyone know when I know. 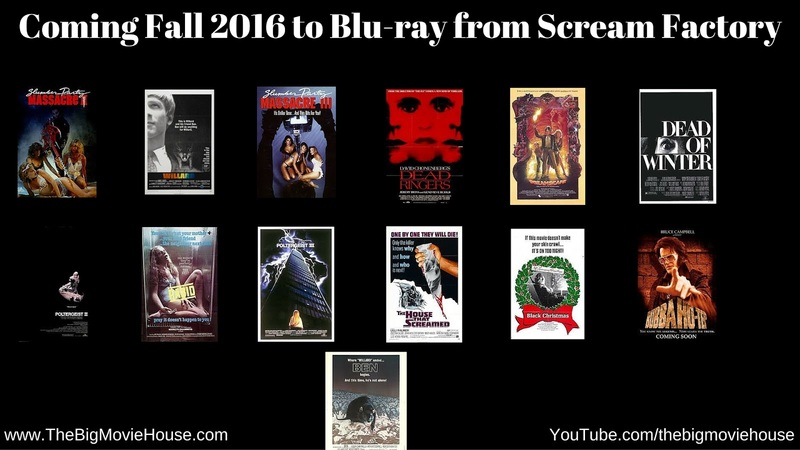 At the San Diego Comic Con last night, Scream Factory announced their slate of releases for the rest of the year. Now, keep in mind that these releases are subject to change, meaning that they could be delayed or outright cancelled, although I have only ever seen a release get cancelled a few times. I am looking forward to all of these releases and plan on reviewing as many as I can. A lonely boy named Danny Garrison befriends Ben, the rat leader of the swarm of rats trained by Willard Stiles. Ben becomes the boy's best friend, protecting him from bullying and keeping his spirits up in the face of a heart condition. However, things gradually take a downward turn as Ben's swarm becomes violent, resulting in several deaths. Eventually, the police destroy the rat colony with flame throwers, but Ben survives and makes his way back to Danny. The film closes with Danny, tending to the injured Ben, determined not to lose his friend. Black Christmas (former titles include Silent Night, Evil Night and Stranger in the House) is a 1974 Canadian psychological slasher film directed by Bob Clark and written by A. Roy Moore. It stars Olivia Hussey, Keir Dullea, Margot Kidder, Andrea Martin, Marian Waldman and John Saxon. The story follows a group of sorority sisters who are receiving threatening phone calls, while being stalked and murdered during the holiday season by a deranged murderer hiding in the attic of their sorority house. Struggling actress Katie McGovern (Mary Steenburgen) is approached by the mysterious Mr. Murray (Roddy McDowall) and invited to an upstate New York mansion to film a screen test. There she meets Dr. Joseph Lewis (Jan Rubes), who is eager to hire Katie as a replacement for an actress who's suffered a nervous breakdown. But the film shoot takes a sordid turn as Katie begins to understand that her role is simply a pawn in Lewis' twisted blackmail games. Elliot (Jeremy Irons), a successful gynecologist, works at the same practice as his identical twin, Beverly (also Irons). Elliot is attracted to many of his patients and has affairs with them. When he inevitably loses interest, he will give the woman over to Beverly, the meeker of the two, without the woman knowing the difference. Beverly falls hard for one of the patients, Claire (Geneviève Bujold), but when she inadvertently deceives him, he slips into a state of madness. Selfish teen Alex Gardner (Dennis Quaid) is coerced into joining a government project in which psychics like him are trained to enter others' dreams. He starts learning to use his abilities to do good, but before long, a new official, Bob Blair (Christopher Plummer), seizes control of the project. A writer (George Wendt) helps Alex uncover Blair's true motives, which involve assassination via dreams. Soon, only Alex and a beautiful scientist (Kate Capshaw) stand in the way of something terrible. The Freelings have escaped their haunted house, which is now being studied by paranormal investigators, including shaman Taylor (Will Sampson). When Taylor realizes that the Beast, masquerading as the Rev. Kane (Julian Beck), knows where young Carol Anne Freeling (Heather O'Rourke) now lives, he goes to warn the family that their daughter is in danger again. To protect Carol, her father, Steve (Craig T. Nelson), and the rest of the family must plot to take down the Beast. Psychically attuned youngster Carol Anne (Heather O'Rourke) is sent to live in Chicago with her Uncle Bruce (Tom Skerritt) and Aunt Pat (Nancy Allen). But that doesn't mean that she's escaped the apparitions that have haunted her in the past. When she starts experiencing terrifying visions, her school psychologist believes that they're figments of her imagination. But this becomes hard to believe when ghostly foes start inhabiting the mirrors in her relatives' high-rise apartment. A woman named Rose is involved in a motorcycle accident, and has experimental surgery performed in order to save her life. However, as a result of the surgery, she develops a taste for blood. Her victims grow in number as well as madness, turning the city into chaos. Part II: A teen (Crystal Bernard) and her friends are terrorized by a rock star (Atanas Ilitch) whose guitar is fitted with a drill bit. Part III: Sleep-over teens are chased around a friend's (Keely Christian) house by a guy (Brittain Frye) with an industrial drill. Nagged by his mother (Elsa Lanchester), bullied by his boss (Ernest Borgnine), a young man (Bruce Davison) trains mansion rats to kill for him.